My family on both my mother’s side and my dad’s side, were farmers. I don’t mean that my parents grew up on a farm, although I have memories of my Great Grandmother on my father’s side raising chickens and growing asparagus in her semi-rural backyard. What I mean is, although they didn’t grow up on a farm, there were echoes of the mid western farmer from previous generations in their traditions and habits. This was particularly true when it came to matters of food. Sunday dinner was a good example. On the farm, dinner was served early in the afternoon, usually no later than 3:00 p.m., more commonly at 1:00 p.m. and it was a production. After all, farmers still had many hours of work to do after dinner and they needed the energy and calories the meal provided. On Sunday, we sat at the dinner table in our suburban house and ate chicken, ham or roast beef, mashed potatoes (not from a box), a cooked vegetable (usually carrots, peas or green beans), sliced cucumbers in vinegar, stringy, crisp celery sticks with salt, red radishes that burned your mouth, and hot rolls and butter. A feast fit for a hard-working farmer. Since this was the official day of rest, and we had no farm chores to perform, the kids helped mom clear the dishes and clean up, then the grown-ups settled down for a rest, and the kids went out to play and burn off some energy. Desert was always served, but usually one or even two hours after the Sunday feast. It was the deserts, and helping my mother make them, that made Sunday dinner memorable for me. Mom was a talented baker and a gentle teacher. Two of my favorite deserts were lemon meringue pie and apple crisp. 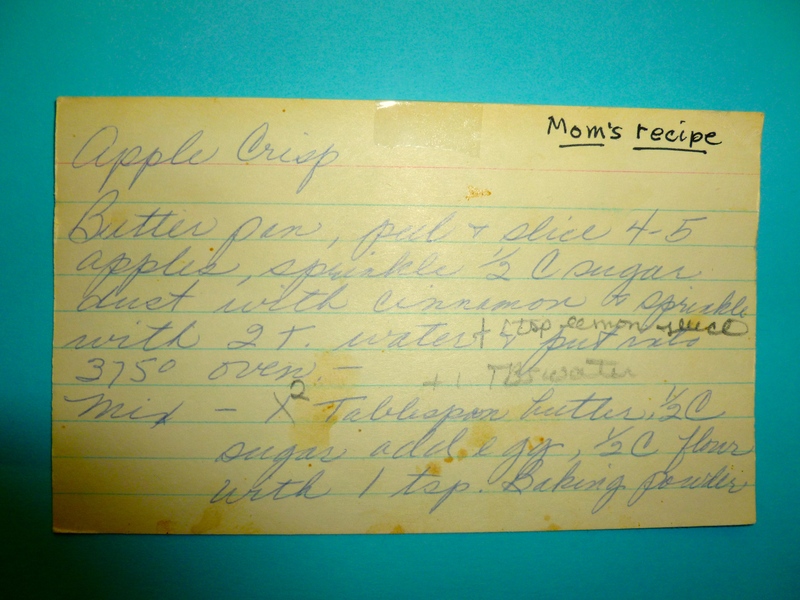 Last Christmas, my sister found two copies of the apple crisp recipe written in my mother’s handwriting. I baked it for Christmas dinner when my son and daughter-in-law visited. My daughter-in-law asked for a copy of the recipe. I started to copy it when I realized that mom’s recipe was written with the presumption that the reader was an experienced baker, or at least had someone like my mom to stand-by and help. Some of the amounts of various ingredients were vague, and some of the steps I knew were left out of the written recipe. I decided to “translate” the recipe for the novice baker. When I finished, mom’s recipe, which had been handwritten on a 3×5 card, had morphed into a two-page, typed essay. It’s moved on to another generation and it was good to have served as a bridge between generations. Very nice! I enjoyed reading about your childhood memories. What a sweet memory and nice that you are able to pass the recipe along to the next generation!